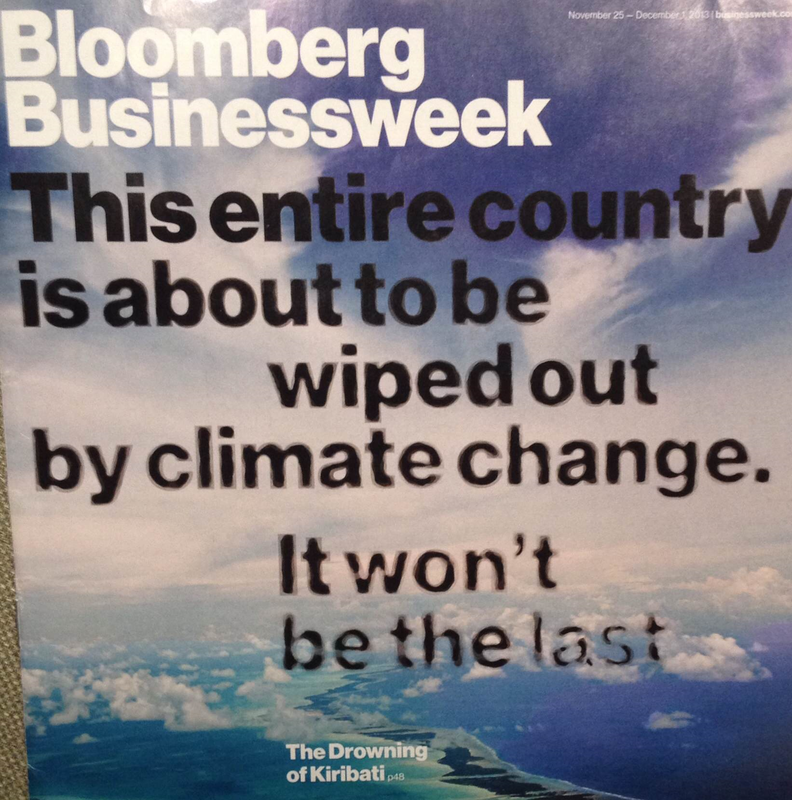 Bloomberg BusinessWeek recently ran a cover story entitled “The Drowning of Kiribati” — a captivating piece about an island nation facing destruction due to rising ocean levels. It is a compelling article. At one point reference is made to the impact of Hurricane Sandy on the eastern coast of the US. The troubling point is that as bad as Sandy was for the people of the northeast, the waves ultimately receded to allow for rebuilding — while that is not expected to be the case in Kiribati. At some point the waves will come and not recede, and the islands will be lost due to rising ocean levels. Also compelling is the time frame involved — estimates indicate that Kiribati could face this ultimate problem by 2030 (a scant 16 years from now). The idea of the need to resettle the citizens of an entire island nation to new countries due to rising ocean levels is eye-opening. The need to do it within the timeframe of a newborn growing to high school age is even more startling. This story has dimensions that go beyond one remote island nation. Regardless of where one stands on the subject of climate change, a parallel theme that jumps out is the need to address resource issues at a global level — and to do so with urgency. Collaboration is needed — with urgency — to optimize resource use with an eye toward preserving resources and the environment for future generations. As noted by Faures and White, sustainable intensification — doing more with current resources and preserving the productivity of the environment — should be at the top of business and government agendas. We all need to take a long-term view of finite resources, and stories like that of Kiribati indicate that we need to act in the short-term through a global network to drive long-term change for sustainability. Our world is global — we are interconnected as never before — we cannot think about serious resource and environmental problems being “far away” and “far into the future.” In both senses, as illustrated by Kiribati’s fate, they are closer than we think.